John Lundstrom. Naval Institute Press Paperback. 2005. The ships are fabled: Yorktown, Lexington, Enterprise, Saratoga and Hornet. The pilots are legendary: Thatch, O’Hare, Flatley. The battles are epic, and etched forever in history: Coral Sea and Midway. When the United Stated entered the Second World War on December 7, 1941, it’s Naval Air Arm was comprised of a core group of professional airmen. 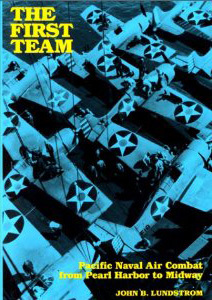 This book is about the men who manned the Navy’s fighter squadrons, the “First Team”. While training of replacement pilots and personnel were ramping up in the States, it was the First Team that would have to keep the juggernaut that was the Imperial Japanese Navy at bay. Armed at first with the Grumman F4F-3 and later the heavier and less nimble F4F-4, these men achieved a remarkable record against a highly trained, highly motivated adversary – one that was flying a superior mount in the Mitsubishi A6M2 Type 0, a.k.a. the Zero. Lundstrom tells the story of these men in an easy to read narrative that keeps your attention throughout. From Butch O’Hare blasting Japanese Betty bombers out of the skies and saving the Lexington, to the confused dusk duel in the sky over the American carriers on the evening of May 7th, to Jimmy Thatch’s frantic fight for survival over the Japanese fleet on June 4th during the Battle of Midway, Lundstrom has it all covered. The book is broken out into four main sections. The first, “The Early Operations”, covers Pearl Harbor, the aborted Wake relief operation and the early raids – Marshall Island, Marcus Island, Lae-Salamaua and of course, the Doolittle Raid. The second section deals with the Battle of the Coral Sea, while section three covers the Battle of Midway. While Lundstrom covers all of the early carriers and their air groups, he pays particular attention to Yorktown. His analysis of Yorktown‘s participation in the early days shows how her experience, more than the other carriers, shaped US carrier doctrine. He makes a convincing argument of how Yorktown lead the way at Midway, and how her presence there accounted for a large part of the victory. Details of her resulting loss and how that experience gave rise to organized damage control and salvage parties, knowledge that likely saved many damaged carriers later in the war, is also covered. The fourth and final section, “Conclusion”, is a catch all area for chapters that didn’t fit the first three sections. Here you’ll find things like the difference between USN and IJN carrier training, the basics of “deflection shooting” practiced by the USN, details on the “Thatch Weave” and even a chapter on “Fighting Colors, Insignia and Markings”. The story of “The First Team” is remarkable, and, thanks to Lundstrom, told in complete detail over 500 pages. First published in 1984 and updated in 1990, this 2005 edition is the first soft-cover/paperback version. I have long wanted to add this to my library, and was quite happy when it was reprinted. The wait was worth it – this is a must have for any serious student of the war in the Pacific. I loved this book! Highly recommended.